The celebration of All Saints’ Day will be held on Thursday, November 1 and the commemoration of the faithful departed the next day Friday, November 2. 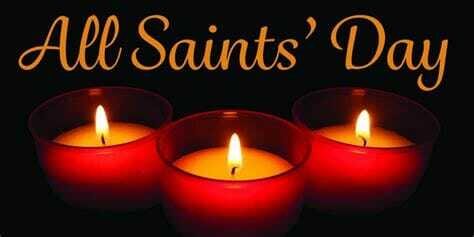 As its name suggests, All Saints’ Day is the feast of all saints. The Church thus honors the innumerable crowd of those who, through their lives, have been witnesses of Christ. If a certain number of them have been officially recognized, after a so-called “canonization” procedure, and given to us as a model, the Church knows that many others have also lived in fidelity to the Gospel and to the service of all. Thus on this day of All Saints, Christians celebrate all saints, known or unknown. This festival is also an opportunity to remember that all men are called to holiness, by different paths, sometimes surprising or unexpected, but all accessible. On November 2nd, the following day, the Church commemorates its faithful departed. Mass is celebrated for all the deceased and especially for those of the past year. This day, as the day before, is traditionally devoted to a family visit to the cemetery and the maintenance of the graves. The pontifical Mass of All Saints presided over by His Exc. Bishop Bernard Barsi will take place at 10:30 in the Cathedral animated by the Little Singers of Monaco and the Mastery of the Cathedral. As every year, the Diocese of Monaco offers to meet around the Archbishop, in the chapel of the cemetery of Monaco, at 15:00 for the prayer of vespers. This will be followed by the blessing of the graves.